Denmark striker Nicklas Bendtner has been banned for one match and fined €100,000 by UEFA for what it is calling "improper conduct" following the celebration around his game tying goal at last week's Group B match against Portugal. The suspension applies to the next 2014 FIFA World Cup match, including the qualifying competition, for which Bendtner is eligible. 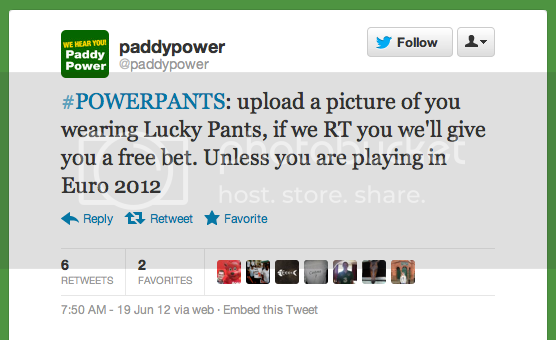 Following the stunt, Paddy Power, ran a marketing campaign around Bendtner's "lucky pants" and has been milking the attention around what it's terming "pantsgate" via it's Facebook and Twitter accounts using the #POWERPANTS hashtag. "This is a hysterical and deeply cynical move by UEFA dictated by pure commercialism and is a far greater penalty than recent UEFA fines for far more serious incidents," the company said in a statement on its website. In addition to running afoul of UEFA's ambush rules, Bendtner also rankled his own team's official betting sponsor, Ladbrokes, which is a competitor to Paddy Power, and reportedly expressed its displeasure with the incident to the Denmark Football Association. Bendtner says he plans to appeal the fine and suspension.